​ HOUSTON – The area retail market closed 2017 by posting some of the most positive absorption figures in the past decade. 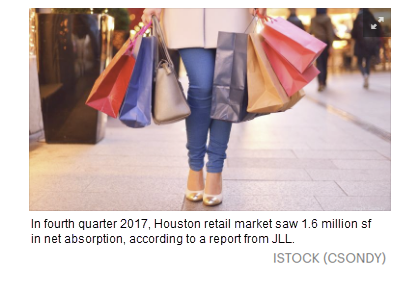 In the fourth quarter, Houston retail saw 1.6 million sf in net absorption, according to a report from JLL. That figure is 23.1 percent above the city's ten-year quarterly average. The market is sitting on a 5.5 percent vacancy rate, which is higher than the city's average vacancy rate since 2014 but still well within a healthy range. Demand from food and beverage users, as well as service-based retailers, fueled much of the demand for retail space in 2017. Larger retailers are still navigating the challenge of finding success in a market dominated by Seattle-based Amazon.com Inc., and that challenge will surely continue in 2018. ​​​​Between April 2016 and April 2017, roughly 1.3 million sf of retail space was returned to the market in Houston due largely to closures of national brands.